Paramedics may have had a very difficult time locating their patient if it had not been for a devoted Golden retriever who was waiting to show them the way to its owner. The Chinese emergency crew had received a call about a garbage man who had collapsed in a residential alleyway in Yuncheng, Shanxi Province. As their ambulance rushed through the narrow alleyways, a Golden Retriever suddenly appeared in front of the vehicle. Instead of simply moving out of the ambulance’s path, however, it started to lead them in the direction of its collapsed owner. 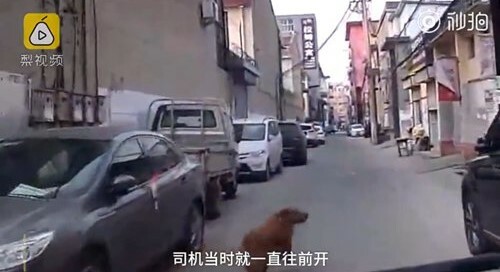 Dashcam footage shows the dog anxiously looking over its shoulder several times in order to make sure the paramedics are following it before the pup picks up speed and runs through the maze of alleyways. Thanks to the dog’s clever hand in the rescue, paramedics were able to find the man and bring him to the hospital for treatment.